Successfully Added Rear View Parking Sensor (Complete DIY Kit) to your Shopping Cart. Rear View Parking Sensor - makes reverse maneuvering save and easy. 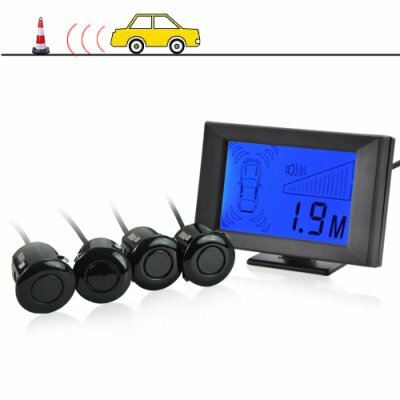 This complete DIY kit comes with sensors that utilize cutting-edge ultrasonic detection technology to notify the driver of the distance and position of obstacles by means of an acoustic beep, voice, or virtual display. This brilliant device uses ultrasonic technology to measure distance in real time and send an audible alert that increases in urgency as you come closer to an object. Along with color-coding, you are sure to park your car with perfect precision every time. From 1 meter and further away, the screen is blue and there is no noise. If an object is .7 to 1 meter, it repeats "attention" and the screen turns purple. If there is an object within .6 meters it turns red and says "warning". Under .3m it says "stop". This is the ideal safety device for backing up, parallel parking, garage parking, and parking in tight areas where the risk of damaging your car is much higher. This high quality waterproof rear view parking sensor is an easy DIY (do-it-yourself) unit that makes a great upgrade to any vehicle. The sensors have been specifically designed to blend in perfectly with your vehicle bumper and can be installed on all of today's big and small cars without the need for any extra parts. Why risk damaging your car from unseen hazards when you can easily protect yourself with this rear view parking sensor? Order one today and relieve yourself of the stress and guess work of parking in tight areas. Not only is CVOE-C47 many times cheaper than competing parking sensors, but the money you save on potential repairs and insurance alone will more than cover the price. High quality, low prices - brought to you by the leaders in wholesale electronics, Chinavasion! Will the C47 reverse parking sensor work in my specific make and model of car? Yes, the C47 sensors were designed to fit in perfectly with any vehicle. Will these parking sensors work in front of the car? Sure! Even though the C47 was designed to be used in the rear of your car, you can still install the sensor on the front and it will still read distance. However, the pictures on the LCD indicator will not update, however, and it will still assume that the camera is on the back of the car (which won't really affect anything though). on 2011-09-29 20:19:11 MUITO BOM!! Comprei e chegou tudo ok! Installation was easy (depends ofcourse on the vehicle), funcionality excellent for this price. I would recommend this product to my friends. They're good.We are happy.After this , I am about to by other thinks from Chinavasion. Excellent seller, very good product! Super fast shipment! as shown in the picture!